This shop is part of a social shopper marketing insight campaign with Pollinate Media Group™ and Kleenex but all my opinions are my own. 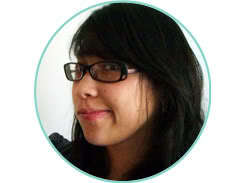 #pmedia #KleenexTarget http://cmp.ly/3/8vNxcO I’m excited to share my cold season tricks and my chicken ginger soup crock pot recipe! 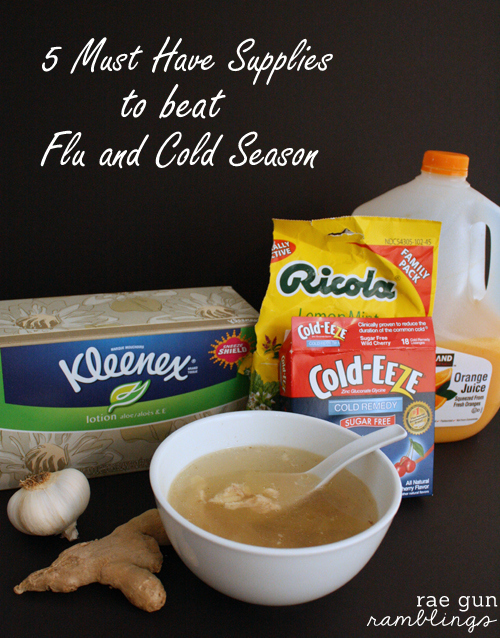 I totally have a system to deal with cold and flu season. It seems to work for us so I thought I would share it. You can have all of this stuff on hand and be ready when a bug invades your home. Part of my arsenal includes my mom’s traditional Chinese chicken ginger soup crock pot recipe and my husband’s favorite aloe infused Kleenex tissues. Orange Juice (or cranberry juice) – Have some kind of juice on hand great for hydrating and upping the vitamin C. I’m a crazy juice drinker so I always have some on hand. But if you guys aren’t juice people grab a can of frozen OJ concentrate or bottle cranberry juice that doesn’t need to be refrigerated just to have available. Early sign vitamin boosts – I love Cold-eeze but the zinc bugs my husband’s tummy so he’s all about the Airborne. I have friends who swear by Emergen-C. Whatever your preferred vitamin booster have some on hand so when you’re around germy people or feel the first signs of a tickle in your throat you can take some. 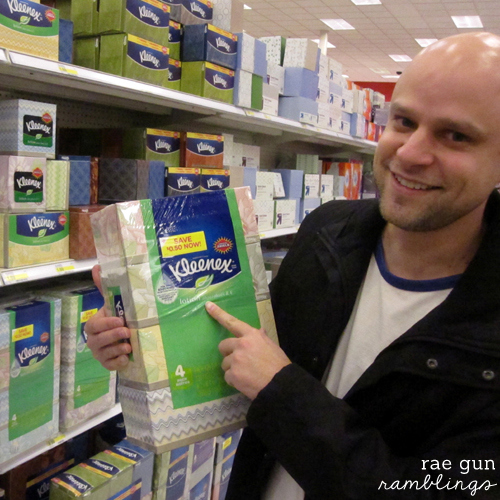 Kleenex – My husband is obsessed with the Kleenex lotion aloe and E. It’s extra soft and doesn’t rip up your nose when you’re blowing it over and over. I thought he was just being picky but last time I was sniffly I tried a different brand’s lotion version and oh my poor nose. I will never buy anything else. This has been a staple in our house for years! Be sure to use this Kleenex coupon if you do need to restock. It’s good for $1 off a 4 pack or bigger at Target. Cough Drops – Whatever kind you like just have something that will soothe a scratchy throat so you don’t have to run out or send someone else out when you’re feeling yucky. 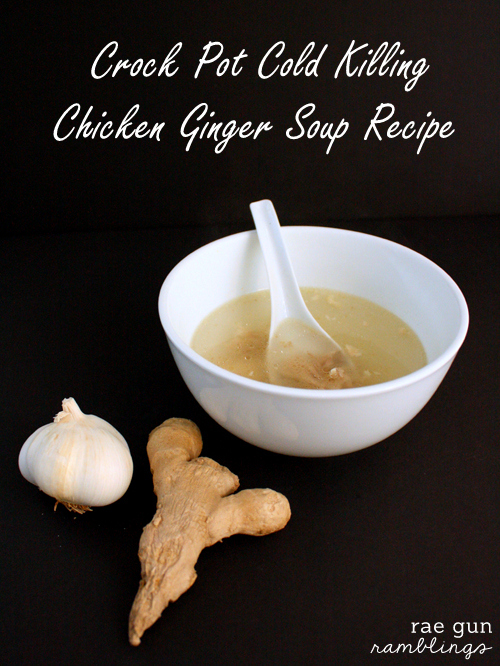 Chicken Soup – I’ve heard in a lot of articles that chicken soup has healing properties. I usually have a can of chicken soup for emergencies but if you have any energy or room in your freezer to make and store ahead, I LOVE my mom’s ginger chicken soup. I make it in the crock pot it’s SUPER easy and you can freeze it so that you have some on hand if you’re feeling too crummy in the moment to throw it together (see my recipe below). This recipe is so flexible just use what you have you don’t even have to worry about the proportions. I’ve made this with 1 thigh to a whole chicken. 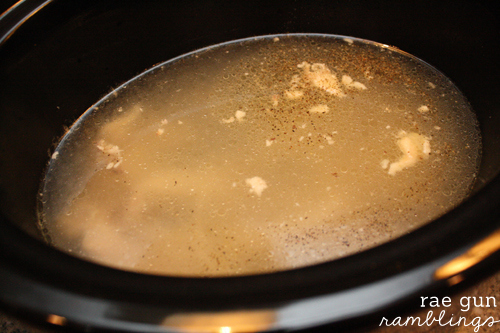 For the garlic you can use smashed cloves or spoons full of that jarred minced garlic. For the ginger use at a piece that’s peeled at least 2 inch for one piece of chicken. The more the better. It’s never been an overwhelming ginger taste for me and I’m not the biggest ginger fan. And then water to cover your chicken or to fill your crock pot. Just throw all the ingredients together except for the salt and pepper. For 1 thigh I used my small crock pot and filled the water until it was submerged (about 1/2 the crock pot full) and for a whole chicken make sure it’s cut in pieces and I fill the crock pot as high as I can with water. I like to use bone in skin on chicken. Cook on high for about 4 hours or until chicken is cooled through and easily pulls of the bone. Discard the skin and bone. Add salt and pepper to taste. When I cook a whole chicken usually it’s more meat in proportion to the broth so I’ll often save some of the meat to use in enchiladas or something. But keep in mind the chicken will be a bit flavorless since it’s been infusing your soup the whole time so if you want to use it in something else you’ll want to use a lot of seasoning. 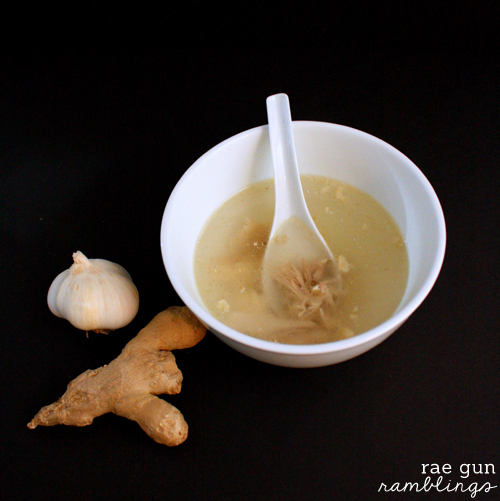 Do not eat the piece of ginger it’s just there to flavor the soup. If you didn’t chop up the garlic you can discard that too. I hope you like it. I swear that this soup and these tricks have definitely helped shorten the life of our colds and flu’s as well as just make the whole experience just a little more bearable. Great timing for this recipe! I’ve heard the flu-bug is going around and it’s a nasty one. I’m hoping to avoid it, as I already had the flu earlier this year and it was a DOOSEY! Man. I don’t think I’ve ever been as sick as I was then. These are great things to have on hand and this soup looks like a great cold-knock-out! Pinning! That broth actually sounds really good even though it’s super simple. :) Great tips! Love all your tips and your soup sounds great – I love having chicken soup on hand for when the bug hits! This couldn’t have come at a better time. I am starting to get that scratchy throat and cough. Thanks for the check list! I’ll be heading into the store to pick up some Kleenex and cough drops! This looks really good! I can honestly say I have never had anything like it! Thanks for all the tips. I am pinning this for my next cold. :) Which will probably be right around the corner. Such great tips! I am pinning this for sure. I need to go stock up on kleenex and cough drops!